I don't even know where to start. I'm so completely deliciously and wonderfully overwhelmed with books at the moment! But..I'm currently reading The Making of Isaac Hunt by Linda Leigh Hargrove. And coming up next? I have At His Command by Brenda Coulter, which I've actually started. It's a Love Inspired book, which is the inspirational imprint of Halequin. These books are hit or miss with me, but this one is a hit so far! I also have the Lost Diary of Don Juan by Douglas Carlton Abrams, and The Last Queen by CW Gortner waiting as well. I'm really looking forward to reading both of these! If you're visiting for the first time, I just wanted to let you know I have a couple of bookish giveaways you might be interested in entering. I'm giving away copies of Julie Lessman's A Passion Redeemed with some other prizes here. And I'm giving away a copy of Matrimony by Joshua Henkin here. 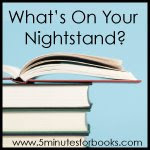 And of course don't forget to go back to 5 Minutes for Books to see what is on everyone else's nightstand! I really liked THE LAST QUEEN, and I think THE LOST DIARY OF DON JUAN looks quite interesting. I'll be looking forward to seeing your comments on those! The Lost Diary of Don Juan sounds like it could be a really interesting read! Looks like a great list of books. Dont you just love being lost with such great books to read everywhere! I love that -- deliciously overwhelmed with books! That's a good place to be, especially if you have time to read them.